As a paramedic/firefighter who responded on 9/11, who was fortunate enough to survive that day, Fabrizio Bivona felt compelled to share my gratitude and admiration, for so many, that gave so much. This book is a compilation of his own personal photo album and diary surrounding the event. His intention was to give some comfort to all those affected by the tragic events of 9/11. This is a moving story of a fire fighter/paramedic with 25 years of experience, who was at Ground Zero during the attacks on 9/11. He witnessed the attacks and responded to the collective cry for help; only to discover that among those calling for help were two of his former partners and several other friends. As he dug through the rubble, he made a promise to all those who lost their lives that their efforts and sacrifice would not be buried beneath the rubble. This book is a compilation of his never before seen personal diary and photos. This will give you a first hand look into the events of 9/11 as they unfold via inspirational stories. This is a sincere attempt to bestow the respect that these heroes truly deserve and to keep their humble voices alive. His hope is that the powerful and emotionally charged stories give some feeling of peace to all the victims of 9/11 and allows the reader to live the moment, through the eyes of the these brave men and women. A 25-year career as a first responder exposed the writer to both the worst and best of humanity. On 9/11 many witnessed for the first time what he has always known; and that is there is a philanthropic depth to the American character especially among many first responders. The daily acts of sacrifice and compassion performed by these men and women are not viewed as heroic but are simply second nature. The book highlights these traits and focuses on the tragedy that was averted by the thousands of individual acts of kindness and bravery that combined to save tens of thousands. 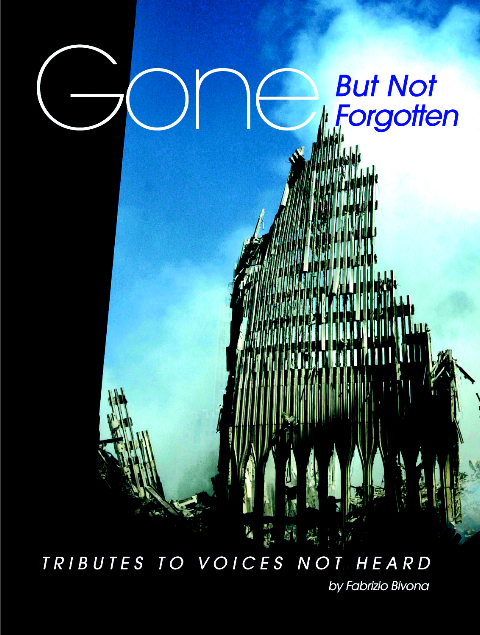 The book is the result of a 5-year comprehensive collection of photos, artwork, stories and quotes that will connect you to 9/11 like never before. If you were personally affected by the tragedy, this book should give you comfort and pride from a totally different perspective. Regardless of your relationship to this tragedy you will discover a positive personal connection that will surprise you. ©ArtAID 2001-7 Art in Service of Humanity.